My dog is weird and believes that dogs on TV are real. He also believes other four-legged animals on TV have the potential to be another dog. Like a cow. Could be a dog. And a horse. That could be a dog, too. And a bear. Yep. It could be a dog. But never a cat. Nope, he knows that cats are … well … not dogs. 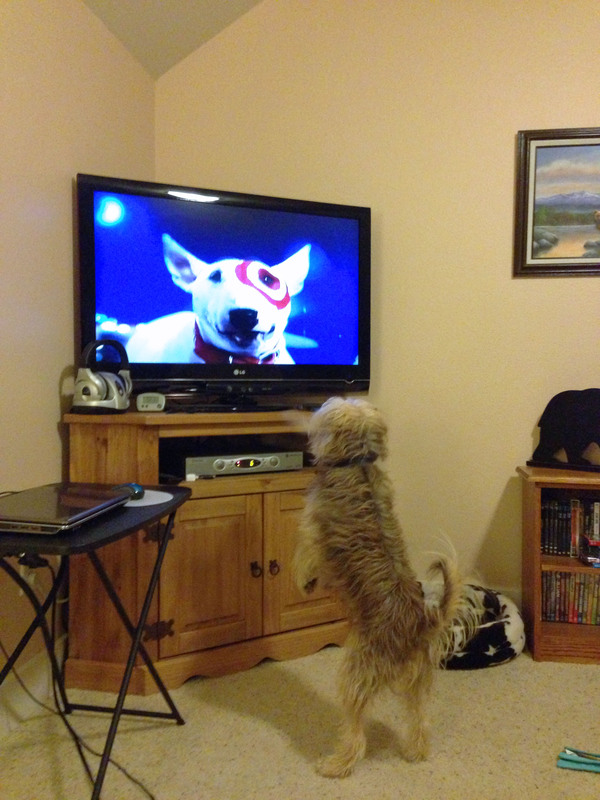 And how does he react when he sees a dog on TV? He runs straight at the TV, barking and growling and trying to sniff the screen for his new friend/foe/playmate/competitor. And now that Target has come out with its new holiday commercial with a giant dog running through the streets, I will get to listen to his idiocy for the foreseeable future. That’s fantastic! My cat watched the Kitty Halftime Show on Animal Planet broadcast during this year’s Superbowl…and acted like he was really engaged. Fun stuff! LOL … my cats have watched the TV from time to time, but never when cats are on, interestingly enough.